More fuel efficient new Falcon prompts rethink on P-plater restrictions. Road safety authorities are re-assessing a blanket ban on probationary drivers getting behind the wheel of turbocharged cars. The re-think has been prompted by the release of a turbocharged four-cylinder version of the locally-built Ford Falcon. VicRoads has already overturned its blanket ban on P-platers driving turbo cars in favour of a system that concentrates more on a power-to-weight ratio that more accurately reflects vehicle performance. Previously, P-platers had to apply for an exemption to drive the low-powered, turbocharged Golf 77TSI. And NSW could follow suit, with the Roads and Maritime Services department (formerly RTA) also reviewing its restrictions as part of a national approach to the controversial treatment of the new breed of fuel efficient cars. Turbocharging has traditionally been associated with performance cars, but in recent years car makers have used the technology to downsize their engines and save fuel. The new VicRoads rule was specifically drafted to accommodate the four-cylinder turbo Falcon, but it opens the door to dozens of other smaller cars that use turbos. Cars with a power-to-mass ratio (PMR) of less than 130 kilowatts per tonne can now be driven by P-platers, if the manufacturer replaces the standard build plate with one stating the car's PMR falls beneath the threshold. “This reduces the regulatory burden of probationary exemption requests on the community, vehicle manufacturers and VicRoads,” said VicRoads’ manager of vehicle safety and policy, Ross MacArthur. He said a decision had not been made on moving to a system based solely on power to weight ratio. Previously, probationary drivers needed to apply to VicRoads for an exemption to drive even small-capacity turbocharged cars such as the Volkswagen Golf 77TSI (1.2-litre turbocharged engine making 77 kilowatts). By contrast, the 3.6-litre V6 Holden Commodore SV6 with 210 kilowatts remains free of restrictions. Ford has already taken the step to alter the build plate on its four-cylinder-powered Falcon EcoBoost range, while several importers are set to follow suit. German brands Volkswagen and Audi both make extensive use of forced induction engines and say they will now examine which models in their range could be re-plated to receive an automatic exemption. Volkswagen spokesman Karl Gehling says he is “pleasantly surprised” by VicRoads’ change of heart. “We fully support a power-to-weight ratio as a good way to identify what is a performance car,” he says. In NSW, the RMS is currently reviewing restrictions on P-platers “to reflect advances in vehicle technology”. A spokesperson said the review would be completed by mid-year and would focus on smaller cars using turbo or supercharging for fuel efficiency. 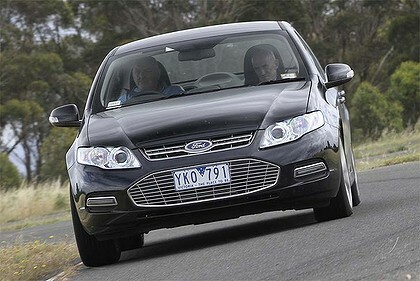 It is anticipated that the Ford Falcon Ecoboost will be among the models cleared for P-platers to drive. Longer-term, a working group is attempting to establish a national standard for probationary driver vehicle restrictions. “Although the working group is active, it is anticipated a national policy will take a few years to finalise and implement, primarily due to the need to establish supporting infrastructure, such as means to identify eligible vehicles,” the RMS spokesperson said. about time. For years i've been saying that it's ridiculous you can't drive a standard AR Telstar turbo etc but you can drive a VE2 SV6 with 210kw. The law was stupid, should of been power to weight in the first place .so if they lift the ban in NSW does mean I can turbo my xr6 and make 220 rwkw and be legal to drive ? Does the cylinder count still apply to the VicRoads exemption, or have they moved to just the 130kw p/tonne meassurement? i have a feeling it would only be on factory cars with marked ptw on there compliance. otherwise an older car with aftermarket turbo will need engineering to prove the ptw is under for the weight of the car..
although in some cases the no turbo rule if floored, but in some cases there is a method to there madness..
eg a vl turbo std only has 150kw at the engine, not much to brag about, a tweak here a tweak there up the boost and boom that engine would have up to and over 220+kw...now putting the vl over the 130kw per ton..
No. 220 rwkw would be within the ballpark of 280-300 at the flywheel. You would not get a compliance plate engineered at that power to weight level (300 / 1.5 = 200 kw per tonne). Even so it seems to be apllying to new cars that get a manufacturers compliance plate. So this means the max you could gun for in a new falcon at a tare mass of 1.7 tonnes is 221 kw. Good stuff, hopefully these new falcons will sell well (fingers crossed!) so it would make it legal for P platers to drive their parents 4 cyl falcon or, if the trend of people that I went to school with is the same everywhere, buy a brand new falcon or commodore with a massive bank loan as soon as they get a full time job. There's still the 6, LPG6, 6T, and SC V8 options available. The 4T is aimed at all the fleets (previous big falcon buyers) that have gone to a "no 6-cyl" rule. It's about time to see governments starting to ditch the current (and fatally flawed) approach to provisional drivers. Here in queensland and I assume everywhere, a person can LEARN to drive in a supercharged V8/turbo'd 4-pot/six-shooter but soon as they get those red plates, they can kiss that vehicle goodbye. Go figure. It's time to competely revamp the way we teach people to drive and this is a good beginning. I'm also about to hit those p-plates myself and while currently own an Au XR6 would love to get my hands on a V8 (au or older). I hope this power/weight change gets done right and allows V8's, or turbos. Case of pick your poison I'd say and at least this should provide the opening for a jump in ford sales and with it hopefully the continued survival of our beloved I6 in all its glory.